Instead of sharing straight from Scripture this time, I am going to share some things about my story. My heart is heavy with many things. 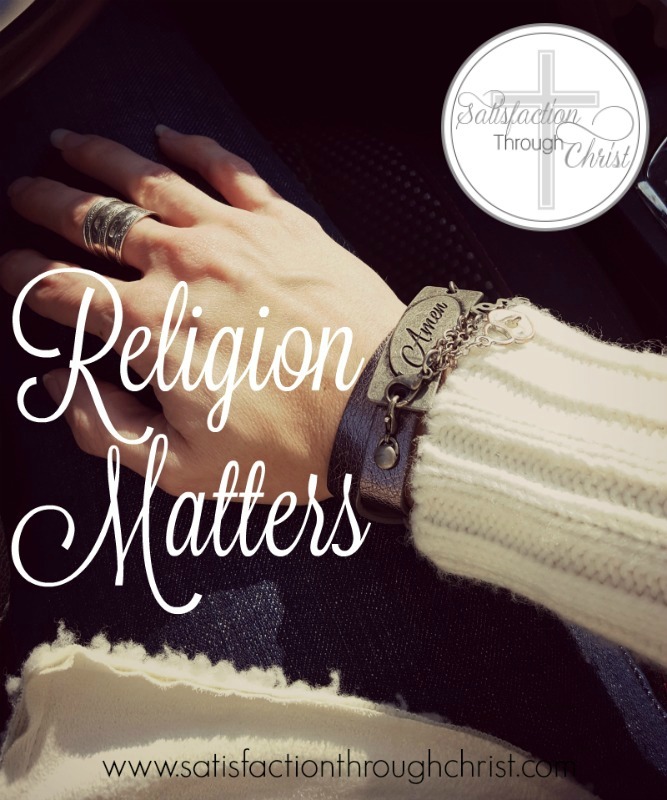 I came across an old Tweet that I had re-tweeted from a previous pastor, with a quote that said something like, “God doesn’t care about your religion; it’s your relationships that matter.” I agreed with it at the time, but things have changed in my heart. While it is true that we as believers are to love our neighbors and to go into the world and make disciples, I now think that religion matters more than what that quote seems to say. I have heard twice this week that the old saying, “don’t be so heavenly minded you’re of no earthly good,” should not be heeded, and I agree. I’ve been a Christian for 35 years, worked in a church for four years, and have attended eight churches in four states over those years. I only bring that up to say that never in that time, until now, have I considered myself Reformed or a Calvinist. In fact, I used to sway the Arminian way. The churches we’ve attended have pretty much all been the “squishy” seeker-sensitive types, welcoming all, making a point to not worry too much about the “little” things in our theology, as long as we agree on the big things. Most of them ranged from being open and accepting to the spiritual gifts to being outright charismatic. We just relocated to Maine a year ago, and that outright charismatic church is one we began attending here. New England isn’t known for having many churches – especially good Gospel preaching ones. As I was researching more into the spiritual gifts since we were surrounded by all of it at this church, I realized that I was in danger of being led astray in all of it. I talked with my husband and we left that church. I delved into studying theology, doctrine, church history, and most importantly, God’s Word. God’s grace turned me around, and brought me back into the fold and changed my thinking. Despite the low number of churches to choose from here, I was able to find a handful of churches that might be okay. We tried two and have attended the second one for several weeks. This church is not Reformed, but does seem to hold to most Calvinistic doctrines, as this is the camp where I have firmly landed. I now see that many of the churches we have attended in the past were more liberal, even though I would not have classified them as such when we were there. I can see elements of things like neo-orthodoxy, the emergent church movement, being very into the social gospel, a focus on spiritual gifts, and roots from the old holiness movement. Not only that, but things like the church library and women’s ministry materials were never screened, and I for one, was exposed to a lot of not-so-good doctrines and theologies. Most of the churches talked about making disciples, but they were truly more seeker-sensitive, bringing in numbers, versus doing the work of discipling. I am sad that none of these churches offered classes or training on things like church history, doctrine and theology. They all seem to have a “get to know us” class, where they do share what they believe. But it’s different than studying good doctrine and knowing what to watch out for. The sermons didn’t cover it, and rarely even convicted of sin. I am sad that they don’t screen materials. I am sad that I have noticed some of the pastors reading “bad” material or following false teachers online, and using some of it in their small groups. I am sad that the worship leaders, likewise, don’t seem to screen the music or where the music came from. All this stuff has just seeped in and twisted the modern evangelical landscape. I don’t think it’s a good thing to be “church hopping.” All of us needs to find a church home. However, please find a gospel preaching church with solid doctrine. Go the extra mile to check them out. Remember that just because a church uses the Bible or Bible verses in its messages does not mean it’s preaching the true Gospel. Such a great post, Kristen! I, too, believe that doctrine matters – a lot! I’m thankful that you’ve been able to find a church that aligns (as closely as possible) with what you’re learning and I pray that you’ll be able to benefit from the teaching and preaching of the Gospel!! Thanks so much, Christie! Although I had heard the true Gospel a number of times before, yes, it is very refreshing to hear the clear Gospel message, no matter what the topic, every week. Through this whole thing, I am ever more each day blown away by God’s amazing grace! I hope this comes across as an honest question and not antagonistic, but why are the gifts of the Spirit seen as so unbiblical and negative? I’m not saying this as strict charismatic or something, I’ve been on both sides and now just want to know what the scripture says about everything and just go by that. But there are several passages in the New Testament where Paul mentions the gifts of the Spirit, and that they are meant to build up the Church, and even said we should be desiring the gift of prophecy. Verse 29 in the same chapter says “29 Are all apostles? Are all prophets? Are all teachers? Do all work miracles? 30 Do all possess gifts of healing? Do all speak with tongues? Do all interpret? 31 But earnestly desire the higher gifts. I’m not saying I agree with how the gifts of the Spirit are faked and abused so often these days, as well as being unorderly and not being tested against the Word of God. However, to me, it seems very clear in Scripture that we are told these gifts are from God, we should not forbid them unless abuse is happening, and we should desire them. I’m not saying I have it all figured out when it comes to the gifts, being given them, and what all that should be like, but doesn’t writing them off all together seem unbiblical?